Your magical moment at the Cottonwood Community Club House was decades in the making. Back in 1875, the Strahan family became the first permanent settlers in Cottonwood. Their first home was at 748 N. Main, a few blocks from this venue. Over time, more families moved to Cottonwood, realizing it was cooler in the summers than Phoenix. Families from the East Coast and Midwest moved here to escape the cold winters and to recover from health problems in this drier climate. As the hamlet grew, the women of the town yearned for a Community Club House which was large enough for community celebrations, weddings, and civic meetings. The question arose: what should the building look like? What style should it be? The answer came from San Diego. In 1915, chief architect, Bertram G. Goodhue, who had studied Spanish Colonial architecture in Mexico, brought those key elements into his designs for Balboa Park which hosted the Panama-California Exhibition. The architecture paid homage to California’s history as the state had at one time been a colony of Imperial Spain and then of Mexico. A young Arizona architect took note of the Spanish Colonial architecture as a way to celebrate Arizona’s history as well. Leslie J. Mahoney stated that he was influenced by the work of Mr. Goodhue, blending elements of Mr. Goodhue’s designs into his own. In 1912, Mr. Mahoney joined Mr. Royal W. Lescher in forming their own architectural firm. 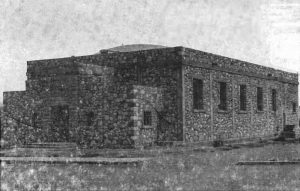 They were quite prolific in designing buildings in Arizona, making an impact on Phoenix’s architecture. Because of the uniqueness of their designs and the extensive number of buildings, the firm of Lescher & Mahoney was considered second only to Frank Lloyd Wright! This is why the ladies of the Cottonwood Community Civic Club hired Mr. Mahoney in 1938 to design their clubhouse on land donated to them three years prior. And so plans progressed for this building. From the building site on Main Street, Mr. Mahoney had an unimpeded view of Tuzigoot, an ancient Sinagua (Native American) village which had been excavated, and stabilized during a 1933-1934 WPA project which provided jobs to area workers. Influenced by the Spanish Colonial architecture as well as the designs of Tuzigoot (a hilltop stepped pyramid shape like those in Mesoamerica), Mr. Mahoney merged the visual vocabulary and materials of the prehistoric Southwest with the stylistic nuances of the Modern design movement in 1938. An example of this merging can be seen in the gray concrete columns which are topped with a horizontal, grooved band along the base of the parapet—an architectural tip of the hat to Native American architecture in the Southwest. 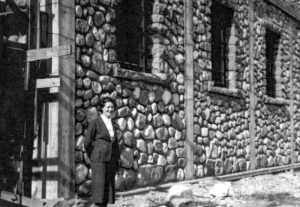 While the concrete is the primary material for the building, the Community Club House is sheathed in rocks native to the Verde Valley. 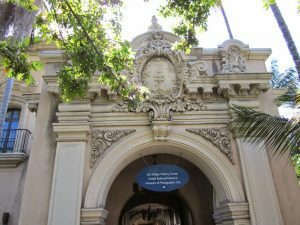 From the building, Mr. Mahoney designed blending materials native to the area with Spanish Colonial architecture, new architectural variants (or styles) developed including Mission, Monterey, Pueblo, and the Mediterranean. After the plans were completed and the $15,000 raised (a huge sum of money during the Great Depression), the Works Progress Administration (W.P.A.) 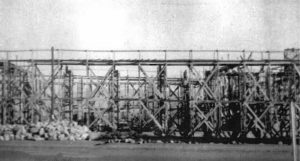 started their preparations and construction in November 1938. By hiring men and women from the community, the W.P.A. created much-needed jobs in Cottonwood. The W.P.A. not only hired construction professionals but also hired professional artists to decorate the building. During refurbishing in 2018, cleaning around the frame of the stage revealed the most vibrant arrows aiming up at the ceiling. It was estimated that this painting today would have cost well over $12,000! On April 9, 1939, the cornerstone was laid. In August, the building was completed; in October, it was dedicated but the work of the women in this community was not over: they continued to fundraise to build the magnificent stage, to furnish the auditorium, to build and equip the kitchen. The building was put to good use quickly and became the focal point for community events. 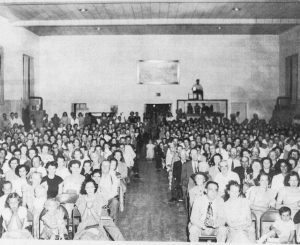 According to an article in Verde Independent, on May 2, 1940, 175 people gathered for a potluck dinner at which the members of the Cottonwood Civic Club (the women who directed the Club House construction project) entertained their families with songs, poetry, literary readings, and dances. Through the intervening decades—through World War II, the Baby Boom, the Cold War, the Viet Nam War, economic good times (and the other sort), the women of the Community Civic Club continued their good work in Cottonwood. In 1989, during the Community Civic Center’s 50th. Anniversary a plaque and a large key honoring the architectural firm Lescher and Mahoney was installed. 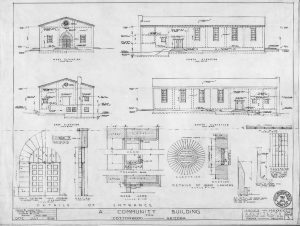 In 1999, a survey resulted in the National Register of Historic Places listing the entire Cottonwood Commercial Historic District on its registry. Realizing that Cottonwood Community Club House had not been significantly altered since 1940, the Club House was honored with its own individual listing on National Register of Historic Places. Soon, the building rang with the joyful sound of wedding bells, the laughter of happy children graduating grade school, and the musical pride played during civic celebrations. Will you be next to hear your wedding bells at the Old Town Civic Center? Reach out to us! Your Happily Ever After Starts at the Old Town Civic Center Where Your “I Do!” Is What We Do!